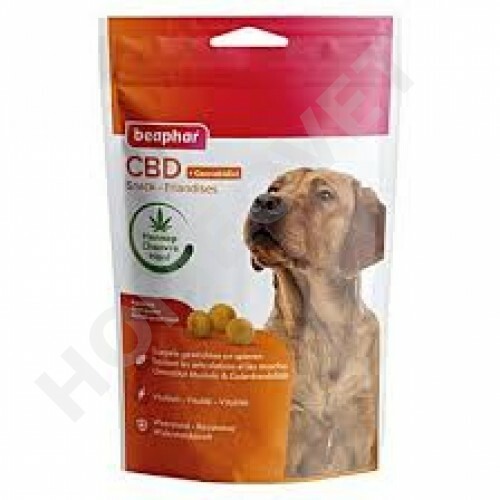 Beaphar CBD snack with tasty chicken flavor contains cannabidiol (0.92% *), which contributes to the general well-being of pets. The Beaphar CBD snack is suitable for maintaining supple joints and muscles, for vitality and for support of the natural immune system. Suitable for dogs from 6 months of age. Cannabidiol (CBD) is a cannabinoid from the cannabis plant Cannabis sativa. CBD has no psychoactive or intoxicating effects. CBD is similar to the naturally occuring endocannabinoid in the animal's body, and also activates the endocanabinoid system. Additional supply of CBD supports the well-being of the animal. The CBD extract used by Beaphar is obtained from the so-called supercritical CO2 extraction. It means that CBD is extracted from leaves and flowers of the hemp plant under the influence of low temperature and high pressure. It ensures best quality of CBD oil, because precious substances like terpenes are retained. Terpenes interact synergistically with CBD, thereby enhancing the positive effect on the animal. CBD oil is a natural remedy for anxiety, arthritis, nausea, inflammation, and other physical or emotional pain, it has no psychoactive or intoxicating effects. Cereals, meat and animal by-products, oils and fats (0.92% * CBD oil). > 30 kg 7 pieces per day.